Royal Vale bone china is a rather low key and innocuous mark. How did it come to be in the eye of the storm in one of the most expansive and high stakes mergers/takeovers in the history of China manufacturing? You can add a comment or ask a question at the bottom of this page. For example, Dawn kindly shared the information and photographs she had on Vale and Royal Vale pottery mark backstamps. 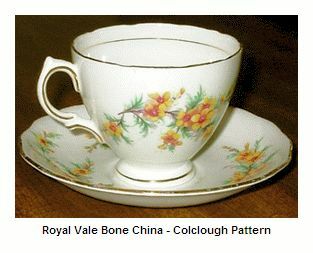 Royal Vale bone china is a backstamp trademark of the Colclough China Company named after Colclough's Vale Potteries in Longton, Stoke-On-Trent, Staffordshire, England. The company was founded by ex Mayor Herbert Joseph Colclough. The 'Vale' label was named after the Vale works in Longton, Staffordshire where Herbert Colclough re-located his manufacturing plant. Mayor Colclough was honoured with a prestigious royal license for his beloved Vale Potteries following a visit to Stoke-On-Trent's Longton town from King George V and Queen Mary in 1913. Colclough was looking to supply the demand from ordinary people for aristocratic fine porcelain china. Herbert Colclough had moved to Longton's Vale pottery after expanding his ever growing business which, by all accounts, was the first china maker to set its stall out to make fine bone china dinnerware as well as fine bone china tea ware. The vision was to make fine bone china affordable for ordinary people who had aspirations to improve themselves. Colclough was the first bone china producer to make individual items available for sale in order for the consumer to gradually build up a collection. Previously, fine bone china had been the exclusive privilege of rich people who would order a complete set of tableware crockery. So it was that H. J. Colclough's company received the royal license to manufacture Royal Vale bone china and backstamp his trademark tableware with official royal approval. The royal license was also applied to Colclough's Stanley backstamp for certain ranges (see separate Royal Stanley page). Royal Vale bone china tea cups, plates and trios are well made items, very regularly traded on ebay. Being 'for the people' there is a lot of Royal Vale bone china about on the secondary market, and that is reflected in the price. 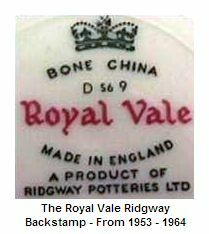 So how did the fairly obscure (to us modern people) 'Royal Vale' bone china mark come to be part of a much bigger story? Nothing is ever simple in business, especially in the China Industry, but this tale of the Royal Vale bone china involves some of the biggest movers and shakers in the history of the China Industry. If you look closely, you can see the little, modest Royal Vale backstamp was constantly in the eye of the stockbroking storm. This wheeling and dealing in the 1950's also marked the beginning of the end of the glory days of fine china porcelain. When the corporates mind take over an art product, watch out because everything is just about to go wrong. In the 1920's Pearsons was a leading cash rich company involved in the development of oil fields and engineering in the 1920's. Today, Pearson PLC have a finger in every media pie, including interests in satellite TV, large publishing houses and daily newspapers. In their oil days, they first helped out, then bought out an ailing China manufacturer called Booths (T. G. and F. Booth). In the 1940's they increased their China industry interests by also buying out Colclough's of Longton, and with it Mayor Colclough's highly prized license applied to the Royal Vale bone china backstamp. 1957 saw the Pearson juggernaut acquire Royal Albert, Paragon and Royal Crown Derby .... a veritable who's who of the best of breed English china makers. This stable of powerfully branded China firms became known collectively as 'Allied English Potteries', although some commentators still refer to this group under the name of Ridgway. In 1964 more significant dealing and shuffling occurred. Pearson's Allied English Potteries split the company in half, retaining Booths and Colclough‘s, and along with it the Royal Vale mark, but effectively selling off the Ridgway/Adderley company to competitors Josiah Wedgwood. As a result, collectors new to Royal Vale bone china ware must be aware there are two distinct phases of production and backstamps. 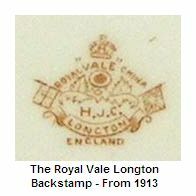 The original Royal Vale production was based at the Longton Vale Potteries from 1913 onwards. The second, or post-war period under the Ridgway label lasted until 1964. Eight years later, in 1972, Pearson effectively purchased the giant name of Royal Doulton. Pearson's controlling interest in the Allied English Potteries meant, in reality, they pulled all the financial strings. The new venture, however, was known as the 'Royal Doulton Tableware' group. Consequently, some accounts of china manufacturer history state that Royal Doulton acquired Royal Vale when they bought the Colclough brand name in 1972. It was the other way around of course, Royal Vale being an integral part of Pearson PLC's which bought out Royal Doulton. What the new Doulton group did with the Royal Vale brand after 1972, I'm not sure - if you know please write in (post your comment below, please). An interesting footnote is that Pearsons pulled out of the China Industry by de-merging the Doulton Group in 1993 after results showed a consistent poor return of only 5% in comparison with 10% from their other sectors. After all, you can get 6% from your local building society! What do the numbers on the bottom of my Royal Vale Service Mean? Royal Vale Cup & Saucer - What Is The Value?